Johnny Depp, Jerry Lewis, Faye Dunaway, Lili Taylor, Vincent Gallo, Paulina Porizkova, Michael J. Pollard. Arizona Dream is a strange film, opening with an elaborate story set in the Arctic, a hunter out with his dogs and sled, braving the elements, almost dying, protected by his dog, returning to his wife and children – although this is a dream from the central character, Axel, played by Johnny Depp, comparatively early in his starring career. The film is the work of Sarajevo-born Serb director, Emir Kusturica, who made an impact with two of his films in the 1980s, When Father was Away on Business and The Time of the Gypsies. 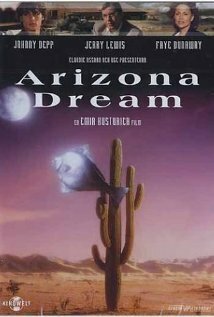 After Arizona Dream, he was to make the films, set in the Balkans, made during the wars, Underground and Black Cat, White Cat. He also made Life is a Miracle. This is Kustirica’s perspective on the United States, real, surreal, an American dream. He has chosen an eclectic cast, led by Depp, but with a rare performance by Jerry Lewis as Depp’s uncle, Faye Dunaway and Lili Taylor as a mother and daughter, Vincent Gallo as a friend of Depp, with a cameo by Michael J. Pollard. The uncle is planning to marry and wants his nephew as best man. Axel, who worked with fish in New York City, comes with his friend, Paul, and is persuaded to work in the car dealership of his uncle. His encounters a wealthy widow, played by Faye Dunaway, and her eccentric stepdaughter, Lili Taylor. The mother has her dreams, wanting to fly, and there are many sequences with experimental flying machines. For audiences absorbed into this scenario, this Arizona Territory, with these characters, the film is very impressive and many consider it a masterpiece. On the other hand, many audiences will probably not be coming into the reality or the dream. 1. The impact of the film? It reputation? 2. The title, Axel’s dreams, Leo’s Dreams, Elaine’s dreams, Grace’s dreams, Paul’s dreams? 3. The prologue, the Inuit and the Arctic, the man, the sled, hunting, the fish, the dogs, about to shoot the dog, its care, pulling the sled, his survival, reunited with his family, their support? Axel and his dream? At the end with his uncle in the igloo? 4. The director, his background, his film career, imaginative, boisterous and vigorous? 5. Axel and his life, in New York, his job, the boat, the fish, relationship with Paul, their time together, influence on each other? His uncle, going back to Arizona, the wedding, being best man, meeting the fiance, at home in Arizona? 6. Paul, his type, extrovert, in Arizona, friendship with Axel, rivalry, the car dealership, interactions with Leo, with the women? The clashes? 7. Uncle Leo, Jerry Lewis, his age, the background of Axel’s parents and their deaths, his being at the wheel? Fostering Axel? Falling in love, at his age, the fiancee being young, the plans for the wedding, Axel as best man? Leo, teamwork and the dealership? Discussing cars with Michael J. Pollard? Offering Paul a job? Axel staying, his reasons, expectations? 8. At the showroom, Paul, Axel and his carefulness? Elaine and Grace, their style, the issue of money, wanting the car? 9. Elaine, as a character, glamour, her husband, his death? Grace holding her responsible? Grace, talking about being the image of parents? The clash between the two women? At home? 10. Elaine, her dreams of flight, the range of machines, the experience of flying, Axel and his helping? Her joy? 11. Grace, her age, anger, resentment, interacting with her mother, with Axel, jealousies, the sexual relationship with Axel? 12. Uncle Leo, his fiancee, trying on the dresses, her relationship with Leo? Leo’s exuberance, his death, the funeral? 13. Axel, the two women, Grace and her death? 14. Axel’s future, going back into his dream?